Charlotte Reznick, PhD, has dedicated her life to helping children and adolescents. Dr. Reznick is a nationally renowned child and educational Psychologist. She is also a former UCLA associate clinical professor of psychology. She was honored with Dissertation of the Year for her work on the effects of parental divorce on adolescents upon earning her PhD in educational psychology from the University of Southern California. "Simple, practical, brilliant. What a wonderful world it will be when all families give their children the gifts presented in Dr. Reznick's book. Joy, success...and health and happiness are just around the corner!" 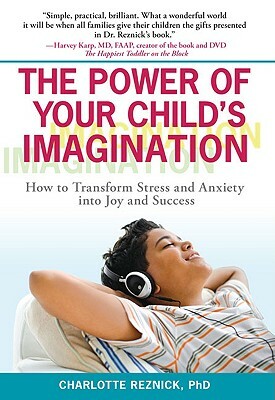 "Dr. Reznick offers a revolutionary approach for parents to help their children handle fears, worries, and self-doubt. Her simple, accessible advice allows kids to develop their self-esteem while creatively tackling problems. This book is a must-read for any parent who hopes to arm their child with the tools to handle life's daily struggles." "This is a wonderful guide for anyone raising children in a stressful world. I'm looking forward to practicing Dr. Reznick's strategies with my own daughters as they grow and become more aware of life's everyday pressures." "As a skilled psychologist, Dr. Reznick draws from her wealth of experience to offer children and parents a treasure trove of skills to relieve stress. She presents well-written, easy-to-follow tools to use in every situation. From visualization techniques to breathing exercises, Dr. Reznick taps the power of a child's imagination to ensure kids achieve peace and success." "Charlotte Reznick shows how kids can access the power of their imaginations for healing, growth, learning, change and peak performance. Her practical wisdom and considerable experience provide the groundwork and the actual imagery tools to reach all kinds of kids - rich and poor, smart kids and learning disabled, confident and unsure - not to mention their parents, teachers and counselors. This is a wonderful resource!" --Belleruth Naparstek, LISW, author of Invisible Heroes: Survivors of Trauma and How They Heal; and creator of the Health Journeys guided imagery audio series.